Your favorite dancers and routines from the latest season! Why See So You Think You Can Dance Live? Back with another season of incredible dancing talent, So You Think You Can Dance has become one of America's top-rated live TV shows since it premiered in 2005. Fourteen seasons later, with its audience is larger than ever, SYTYCD is bringing the top 10 finalists to a theater near you this fall! 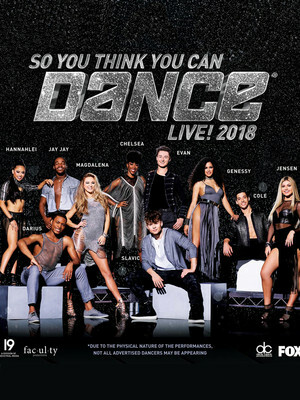 The perfect chance to see your favorite finalist perform live in the flesh, the SYTYCD live tour will feature the routines, moves and grooves of Jay Jay Dixonbey, Chelsea Hough, Cole Mills, Jensen Arnold, Slavik Pustovoytov and more!. Seen So You Think You Can Dance Live? Loved it? Hated it? Sound good to you? Share this page on social media and let your friends know about So You Think You Can Dance Live at Lynn Memorial Auditorium. Please note: The term Lynn Memorial Auditorium and/or So You Think You Can Dance Live as well as all associated graphics, logos, and/or other trademarks, tradenames or copyrights are the property of the Lynn Memorial Auditorium and/or So You Think You Can Dance Live and are used herein for factual descriptive purposes only. We are in no way associated with or authorized by the Lynn Memorial Auditorium and/or So You Think You Can Dance Live and neither that entity nor any of its affiliates have licensed or endorsed us to sell tickets, goods and or services in conjunction with their events.